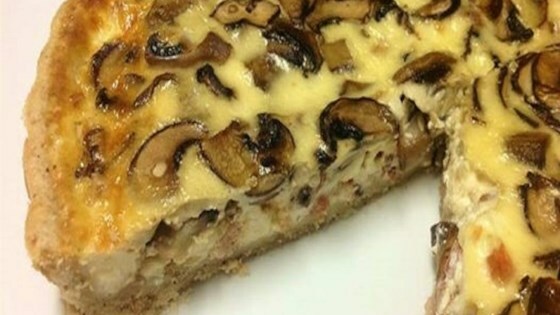 "A delicious quiche-like tart with chanterelles that has a slightly firmer texture due to the chevre, and an earthy nuttiness that comes from the ground hazelnuts in the tart shell. Pairs perfectly with a small mixed salad that has been simply dressed with a light vinaigrette. A small amount of chevre crumbled over the top of the wedges of tart along with few extra sauteed mushrooms amps up the flavors in the tart and makes a nice presentation." Preheat the oven to 350 degrees F (175 degrees C). Spread hazelnuts onto a baking sheet. Toast in the preheated oven until golden brown and fragrant, 10 to 15 minutes. Let cool. Transfer hazelnuts to a food processor and pulse until finely ground. Add flour and salt; pulse to combine. Add butter pieces 1 at time, pulsing in between until mixture has a coarse, grainy texture. Add egg yolk and pulse once. Pour in iced water 1 tablespoon at a time, pulsing once or twice after each addition, until you can pinch the dough together. Do not over-process. Turn dough out onto a work surface and form into a ball. Wrap in plastic wrap and refrigerate, at least 30 minutes or up to 1 day. Melt butter in a large frying pan over medium-high heat. Saute shallot for 1 to 2 minutes. Add mushrooms and saute until tender and liquid has evaporated, 5 to 7 minutes. Remove from heat, season with salt and pepper, and let cool completely. Preheat the oven to 375 degrees F (190 degrees C). Line a 10-inch tart pan with a removable base with parchment paper. Remove dough from refrigerator and let sit for a few minutes. Roll out into 12-inch circle on a lightly floured work surface. Carefully place dough into the prepared tart pan. Roll a pin over the top of the dough to trim it. Gently crimp the dough rim along the fluted edge of the pan. Line the tart shell with a piece of aluminum foil and fill with pie weights or dried beans. Bake in the preheated oven until set to the touch, 8 to 10 minutes. Remove the weights and foil; continue baking until shell is golden, about 5 minutes more. Transfer to a rack to let cool. Reduce oven temperature to 350 degrees F (175 degrees C). Place chevre cheese in a bowl and lightly beat with a wooden spoon until mostly smooth. Add eggs and beat to combine. Mix in half-and-half until smooth. Season with salt and pepper. Pour cheese mixture into the pastry shell. Scatter the cooled mushrooms evenly on top, gently pressing them in. Sprinkle parsley on top. Bake in the preheated oven until pastry edges are browned and filling is set, about 30 minutes. Transfer to a rack and let cool completely, at least 30 minutes. Remove the pan sides and place tart on a serving plate. Serve at room temperature. See how to make a creamy mushroom stew with wild mushrooms. Feel free to use any other wild mushrooms such as oyster or baby portobellos. You can use substitute shallot with onion if desired.